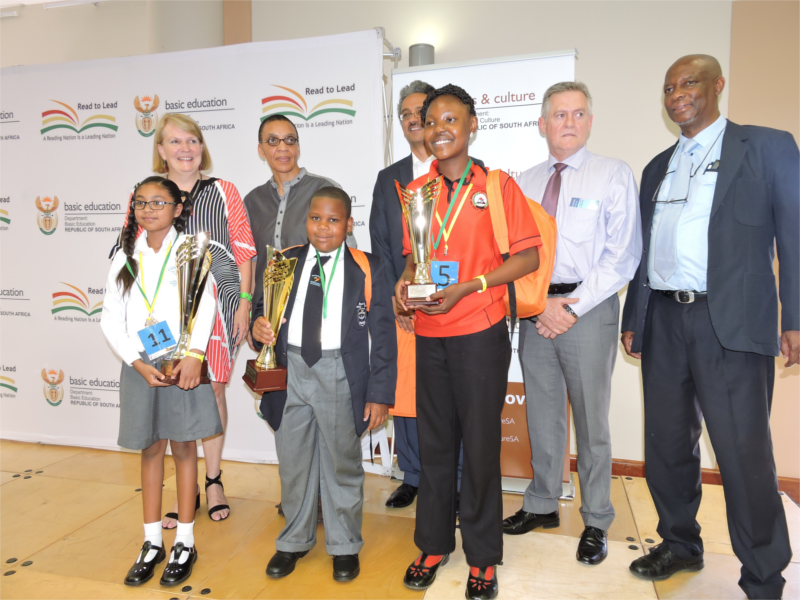 The Department of Basic Education held the National Spelling Bee at UNISA in Pretoria on Saturday 29th October with the country’s top 27 spellers in grades 4-6—the provincial spelling bee winners. The competition was tough. In Round 1, only one speller was knocked out; Round 2, same and Round 3– one more. They spelled the words ‘altruism’, ‘querulous’, ‘ignominious’ and a whole lot more! The Elimination Round was fierce. One by one they were out. Tears, cheers, and fears….. Then there were two spellers vying for the championship and the winning word was “colloquial”. Nine year old Mayuri Govender from the Northern Cape won 1st place, Mateo Joubert from the Western Cape was 2nd, and Naledi Mashatola from Limpopo came in 3rd. What a day!! The spellers were all excellent. What’s more, their journeys were as varied as the schools and communities they came from. This year, Camp I Am and Old Mutual supported the Free State, Gauteng and Western Cape Spelling Bees and got to see some of them. In August we celebrated 11-year old Lesedi Tefane from Orange Farm, one of our campers, who won the Gauteng Spelling Bee. In September we were in the Free State for Atlehang Moroanyane’s win, then we headed south to witness 10-year old Mateo Joubert win the Western Cape Spelling Bee. On Saturday at UNISA, Yvette Joubert, Mateo’s mom, sat in the front row so that he could see her when he went to the podium to spell. She was happy. Mateo is a gentle child and a voracious reader and taking part in spelling bee gave him another platform to express himself. The spelling bee is about getting children to read and not just to memorise spelling words. It also builds their confidence, public speaking and communication skills as they must stand in front of an audience (scary for some children) to spell the words. When we first met Yvette in September, she didn’t speak much. But in her quietude the love and strength of a mother witnessing her son exceed expectations were palpable. “He wants to be a scientist” she said, as she shared a glimpse of their lives during a break at the national competition on Saturday. She talked about the generosity of her community radio station that sponsored her flight to Pretoria and a listener who took care of her transport so that she could be with Mateo. Mateo comes from Mitchells Plain, just outside Cape Town. It’s a community that is economically deprived and one of the two worse areas of crime in the country with a serious problem with drugs and drug related crime. He attends a regular school there. The journey from Mitchells Plain to Pretoria is 1308 kilometres by road or a two-hour flight; but for Mateo it didn’t start this year. His love of reading is his journey to different places and his belief that he can. You see, Mateo reminds us of the story of the Little Engine, a stranded train that couldn’t find an engine that was willing to take it on over a hill to its destination. Only a little blue engine was willing to try and, while he was pulling the engine he kept repeating the mantra “I think I can, I think I can” and the little engine pulled the stranded train over the hill. Mateo Joubert, on the strength of his efforts, hard work and believing “I think I can”, HE DID! We’re so proud of him. Congratulations to all the spellers, you’re all WINNERS! And finally, as the 2016 Spelling Bee season ends, Camp I Am thanks the many supporters, well-wishers, friends and colleagues from the Departments of Education in the Free State, Gauteng and the Western Cape that we’ve had the privilege of working with. 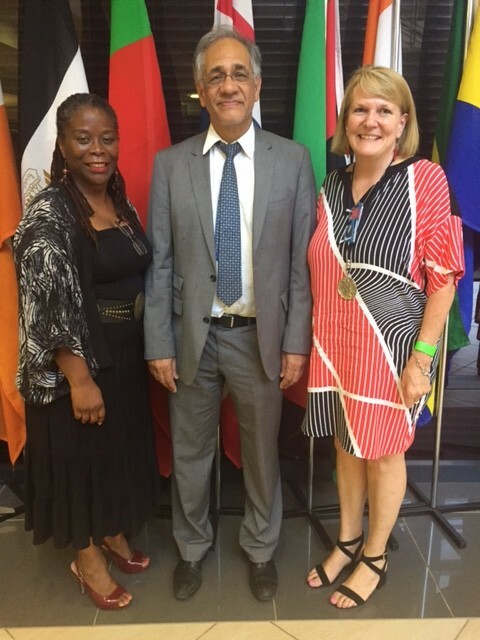 A special shout out to what we call the Department of Education rockstars- Nicolene Thomas (Gauteng), Keitumetse Plaatjie (Free State) and Portia Smit (Western Cape). It was a fun year with 180with Bob on 95.9 Kaya Fm, and thanks to Bob Mabena for being the emcee for the Gauteng Spelling Bee. And finally, Old Mutual, a great BIG THANK YOU for the amazing partnership and making Camp I Am’s work greater. Together we’ve done more! Photo credit: College of Human Sciences at UNISA.